Demons are very conscious of authority and adhere slavishly to the “ Chain of Command ” and the line of authority structure. There are Chief Kings and Chief Princes and under them are Kings and Princes who rule over various geographical and spiritual areas. There are kingdoms, principalities, dominions and powers which are administered by Kings and Princes. For example, each state in the United States is ruled over by a Prince. Some examples: Illinois (Roman Catholic); Indiana (Rebellion); Pennsylvania (Woman Preacher); Louisiana (Southern Curses); Texas (Power); Minnesota (Adultery); Wisconsin (Madness [mental disorders]); Michigan (Psychology); New York (Sickness); Washington D.C. (Rebellion); Arkansas (Occult). At the time this was written, Florida had changed from control by the Prince of the Occult to the Prince of Fantasy and California had switched from Woman Preacher to Fantasy. The control of a geographical area seems to rest on the success of a prince in controlling the majority of the persons within that place, but it also has to do with the ferocity and power of that prince. Raw power is the key to control in the Satanic structure. A General is in charge of a Legion (6,000) while a Prince will control a number of Legions. A Ruler or Captain commands a cohort (600), and there can be Chief Captains and Chief Rulers with still more authority. A Centurion controls 100 demons and if he controls less than a hundred demons, he is called a Strongman. Any demon in authority will direct how many, when and where pain spirits are to attack and how sustained the attack is to be. These pain spirits are called Imps by those in charge. Because of the rigid authority structure, a wise move in dealing with spirits is to bind all the spirits, especially the ruling ones and the ones of violence, fighting and murder. If you are successful in this you will prevent them from galvanizing their strength against you and the workers, or at least will hinder it. If after the binding, you are unable to dislodge the leaders, by-pass them and begin to pick off their root spirits. These will be the lesser demons on whose strength they rely for holding out. By digging away at the roots, you diminish the ruler’s power and weaken them. This makes them easier to throw out later. It is always in order to harass and wear down the enemy. 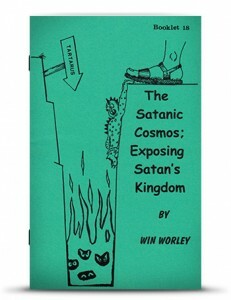 The following is an excerpt from “The Satanic Cosmos-Satan’s Kingdom Exposed, Booklet #18″ by Pastor Win Worley. Copyright © 1983 by Win Worley, Revised 1993. All rights reserved. No part of this publication may be reproduced or transmitted in any form or by any means, electronic or mechanical, including storage and retrieval system, without securing permission in writing from the publisher, WRW Publications, PO BOX 9309, Highland, IN 46322.